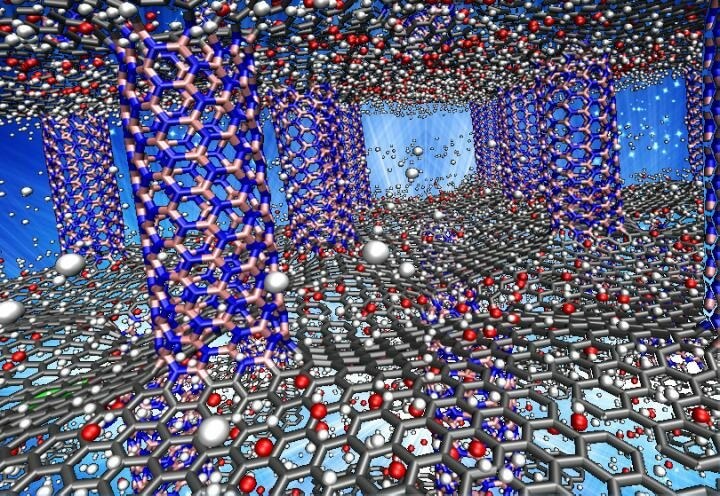 According to Rice University scientists, graphene layers that are separated by nanotube pillars of boron nitride may be an appropriate material to store hydrogen fuel in cars. The Department of Energy has set standards for storage materials that can make hydrogen a practical fuel for light-duty vehicles. In a new computational study, it was determined by the Rice lab of materials scientist Rouzbeh Shahsavari that graphene and pillared boron nitride may satisfy these conditions. The research work undertaken by Shahsavari and Farzaneh Shayeganfar is presented in the American Chemical Society journal Langmuir. Shahsavari’s lab has already used computer models to determine the resilience and toughness of pillared graphene structures. They later added boron nitride nanotubes into the mix and modeled a unique three-dimensional architecture. Researchers have successfully made samples of boron nitride nanotubes that smoothly bonded to graphene. Pillars in boron nitride graphene make space for hydrogen atoms just as how pillars in a building make space between floors for individuals. The main challenge is to make hydrogen atoms enter and stay in adequate numbers, and to also exit when required. In a recent molecular dynamics simulation, researchers noticed that either pillared boron nitride graphene or pillared graphene offer a sufficient surface area of around 2,547 sq.m/g with positive recyclable properties under ambient situations. Their models demonstrated that the addition of lithium or oxygen to the materials will help them to bind hydrogen atoms even better. The researchers focused the simulations on four variants: pillared structures of boron nitride or pillared boron nitride graphene doped with lithium or oxygen. In ambient pressure and at room temperature, oxygen-doped boron nitride graphene was observed to hold 11.6% of its weight in hydrogen (its gravimetric capacity) and around 60 g/l of its volumetric capacity. Oxygen-doped boron nitride graphene proved to be the best compared to technologies like metal oxide frameworks, porous boron nitride, and carbon nanotubes. At a low temperature of -321°F, the oxygen-doped boron nitride graphene was able to hold 14.77% of its weight in hydrogen. The Department of Energy currently aims to develop an economic storage media that can store over 5.5% of its weight and 40 g/l in hydrogen under moderate conditions. The ultimate aim is to achieve 70 g/l and 7.5 weight percent. According to Shahsavari, hydrogen atoms were adsorbed to the undoped pillared boron nitride graphene because of the weak van der Waals forces. When the material was doped using oxygen, a better surface for incoming hydrogen was created and the atoms bonded firmly with the hybrid. Shahsavari stated that this could result in delivering hydrogen under pressure and exiting of the hydrogen when the pressure is released. Adding oxygen to the substrate gives us good bonding because of the nature of the charges and their interactions. Oxygen and hydrogen are known to have good chemical affinity. The researchers said that the electron mobility of graphene and also the polarized nature of the boron nitride where it bonds with the graphene are sufficient to make the material highly suitable for applications. He stated that the structure must be strong enough to easily satisfy the Department of Energy’s requirement, according to which a hydrogen fuel tank should be able withstand 1,500 charge-discharge cycles. Shayeganfar, previously a visiting scholar at Rice, is an instructor at Shahid Rajaee Teacher Training University in Tehran, Iran. The National Science Foundation-supported DAVinCI supercomputer and the BlueBioU supercomputer were used by the researchers to perform this study. Both the supercomputers were procured in partnership with Rice’s Ken Kennedy Institute for Information Technology and are administered by Rice’s Center for Research Computing.